* Please check your child’s cubbie and replace cold-weather changes of clothes with warmer weather alternatives! * Take home boots and snowpants. We promise…it’s over. * Scholastic Book Clubs Online Ordering System – visit http://www.scholastic.com/bookclubs – enter code GW8T9. Every order placed online earns rewards for our classrooms! ** Welcome to May! And Welcome Spring!!! This month, we are highlighting a lot of fun ways that you – with your children – can add some green to your home. Let us give you some tips and ideas for one of our favorite seasons. You can grow awesome, juicy tomatoes on your deck or patio this summer. Big veggies, gorgeous flowers…in small spaces. Easy for kids to plant, tend and observe! Some vegetables grow very well in containers. It is important to understand how much space the adult plant will require for roots and the plant. A variety of lettuces and spinach can be grown in a long planter box. Peas and beans can also be grown in a planter box. Tomatoes, peppers, carrots and onions can be grown in a deep planter pot. Read the package instructions for ideal spacing and growth of the plant before choosing a specific variety. Herbs are also ideal for growing in planters. Basil, Chives and oregano can be planted in a small, shallow container that can be moved inside during the winter to extend the growing season of the plant. Vegetables that require a lot of space such as corn are not recommended for container gardening. Other limitations may include the amount of light and shade where the container will be placed. Research the varieties of the desired vegetable and choose one that will grow well in the amount of sunlight available and temperature in the local climate. he benefits of growing from seeds are the large number of choices available to grow. When purchasing seedlings you are limited to those varieties that are available at the local nursery store. Follow the instructions included with the seed packet or seedling when it was purchased. It is a good idea to use soil that has a timed fertilizer in it already. Water the soil thoroughly after planting and verify the water drains effectively. Plants will not grow well in sitting water . Plants growing in a container will need regular watering, perhaps as often as every day if the weather is hot or dry. Check the soil daily by pressing a pencil into the pot to a depth of three inches. If the pencil does not have any soil attached when it is removed the plant should be watered. Harvest the vegetables as they ripen from the plant. Once fall arrives cover the plants at night to protect them from frost. This will extend the growing season of the plants. Container gardening is a fun way to grow your own vegetables and herbs in a limited space. It is also an excellent introduction to gardening for someone who doesn’t have the time to take care of a full garden. Gardening teaches kids where food comes from, responsibility and patience. A great way to get kids involved is to give children their own tools such as rakes, shovels, watering cans, gloves andmud boots. These can be found at the Dollar Store, WalMart, Menards and Home Depot, especially this time of year. Looking for a cute project for a end-of-the-year teacher gift or visiting family this summer, try one of the unique projects below! Use three terra cotta pots of different sizes to create a wind chime with kids. Before stringing the pots together to create the wind chime, children can paint the outsides using acrylic paints. tart by making a loop and tying the twine so the finished wind chime will have something to hang from. Threading and tying knots encourages kids’ fine motor skills. Kids thread the largest of the three terra cotta pots onto the string using the hole in the bottom of the pot. Thread a wooden bead underneath the pot and tie a knot to secure it. Thread the medium-sized pot onto the twine and situate it so it just touches the bottom of the biggest pot. Thread a bead onto the twine and secure it with a knot. Do the same with the smallest pot. Tie another wooden bead or a bell to the bottom of the twine so that when the terra cotta wind chime blows in the wind it bumps against the side of the smallest pot. By turning a terra cotta pots upside down, stacking them on top of each other and using a saucer, a birdbath can be created. Children can paint the outsides of each 12-inch, 14-inch and 16-inch terra cotta pot–along with a saucer for a 20-inch terra cotta pot–using acrylic paints. Once the paint has dried, have an adult spray the inside of the saucer with a clear gloss sealant so the water will stay within the birdbath.Kids assemble the birdbath by stacking the terra cotta pots with the 16-inch at the base with the opening of the pot to the ground, then place on the 14-inch pot and last the 12-inch pot. Secure the saucer to the top of the 12-inch pot with extra-strength waterproof glue. Kids can turn broken bits of other pots and dishes into a mosaic terra cotta flowerpot with the help (http://www.ehow.com/list_6600409_terra-cotta-pot-crafts-kids.html) of some tile grout. Kids can brainstorm an idea or design for the pot and use a pencil to create an outline on the terra cotta pot. we need to know by the end of May! Please click on the button below to open a PDF of the form. ** We’re looking for teachers, assistant teachers, aides or substitutes! Do you know anyone who would make a great teacher, assistant teacher, aide or substitute teacher at Child’s Play? We are actively recruiting for full-time, part-time and casual positions on our team. We just launched an addition our website: http://www.childsplayonsuperior.com/employment where you can find a position description and our application. Please share this with anyone who might be a good fit for our team! Cooking, baking and playing in the kitchen can be a great way to make a snowy weekend much more fun! 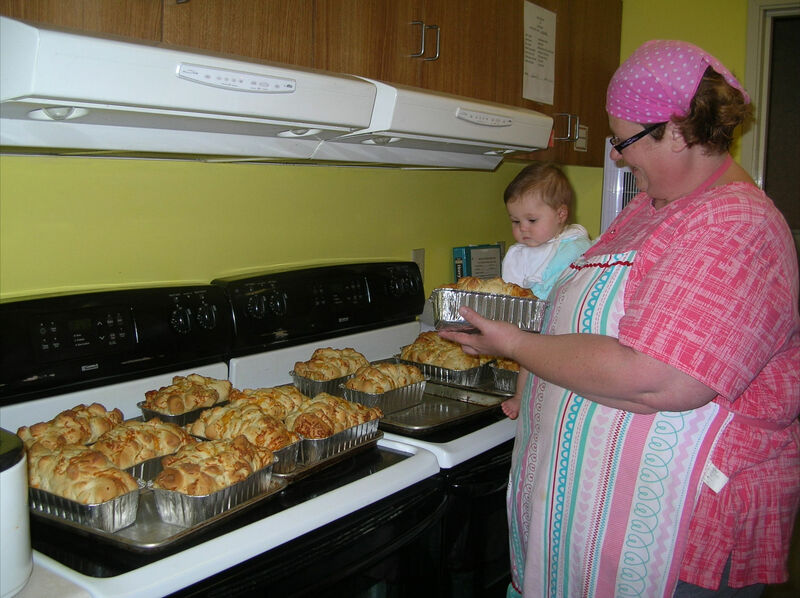 Check out our new recipes below and visit our website (https://childsplaylearningcenter.wordpress.com/family-cooking-corner-our-favorite-recipes/) for more Family Cooking Fun! Click on the button below for a printable PDF. Dirt Cake – after playing in it all day, here’s a version your kids can dive right into…with a spoon. While you are making the dirt cake, occupy little fingers by surrendering some of the pudding for writing practice. On a clean countertop, have your child spread pudding into a puddle with their hands. Then, have them write their name, your name or any other word they might know. For kids who hate to practice, they can’t resist learning this way. May 24, all day SASD – No School – sign-up if you plan to attend. May 31 Lake Country – Last Day of School! If you haven’t already – please turn in your sunscreen permission slips and $10 for center sunscreen or supply your own in your child’s classroom. Ms. Shirley has been with Child’s Play for 16 years! She has been in her current role for 3 1/2 years. Ms. Shirley enjoys bike riding, taking her dog Dakota for a walk, reading, collecting Cherished Teddy Bears and spending time with her family. In fact, she considers herself an expert in being there for the people she loves. Ms. Shirley’s favorite color is purple and she loves country / soft rock music. In fact, she’d love to meet Elvis if she could! She is most proud of her son Derick, who is in the Navy and her daughter Tiffany, who is a teacher and will be making her a grandma in September! Ms. Shirley’s favorite thing about Child’s Play is that it’s like an extended family. She has wonderful co-workers who work together. She loves the toddler room because all of the teachers in this space work so well together. Ms. Shirley wishes every parent would know that she is here for the children and she treats them as if they were one of her own. She really enjoys her job. Especially at Christmas time – her favorite holiday! Her favorite dress up day, however, is during football season when she can wear her favorite t-shirt or jersey! If Ms. Shirley could leave you with one thought it would be to live life to the fullest! 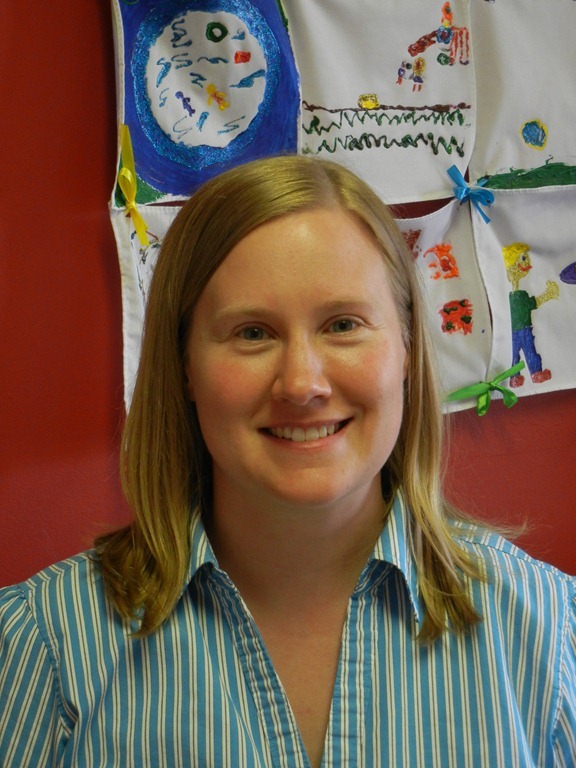 Ms. Vicky is a 2009 Graduate of Lakeshore Technical College in EArly Childhood Education. She has been with Child’s Play for 3 years and has been in the Little Wonders room for 1 year. She already considers herself, an expert in being a good toddler teacher! Ms. Vicky loves spending time wither family and friends, geneaology – she recently traced her husband Jon’s family back to the 1500’s! Ms. Vicky loves working with Ms. Shirley, Ms. Penny and Ms. Lynn. She enjoys that they all get along great and work as a team. She also loves to see her toddlers every day. their kids because they grow up way too fast! If Ms. Vicky could meet anyone, alive or passed, she would like to meet her Grandmother and Aunt. They both passed away in the early 1970’s and she knows she would have had a great relationship with both of them! Ms. Vicky loves coming to work every day to play and teach her toddlers. She has a lot of fun. She can’t believe how smart 1 year olds are! Copyright © 2013 Child’s Play Learning Center, All rights reserved. You are receiving this email because you are a member of the Child’s Play Family. – It’s Winter Time! Be sure to send hats, mittens, snowpants and boots with your children every day! Feel free to leave a set at Child’s Play if you have extras. – Please be sure to call if your child is not coming or if your schedule is changing. We are required, by law, to check on you if you are more than 1 hour off of your regular schedule! – Scholastic Book Clubs Online Ordering System – visit www.scholastic.com/bookclubs – enter code GW8T9. Every order placed online earns rewards for our classrooms! – All menus and calendars are available on the main page of the blog that now houses this newsletter! Check them out! – Please call if your child will not be at Child’s Play due to a vacation day or illness. – Please email cponsuperior@hotmail.com if any of your contact information has changed, or if you would like to add new contact information or people for this newsletter. This month, we celebrate our 25th Anniversary with 25 ways to love! Throughout February, you will see ways that we will celebrate how we love each other, ourselves, our planet and the blessings we receive each day. Share a dance – turn on the music and dance with your kid/s. Make a card for a neighbor. Visit a relative you haven’t seen in a while. Hugs and Kisses – of course. Give your guniea pig an extra carrot. Put love a note in someone’s lunchbox or purse. When you start to argue with someone about something silly – laugh instead. Make extra dinner and drop it off for a friend. Bake some biscuits or other pet-treats and deliver them to the neighborhood animals – check out the Family Cooking Corner for recipes! Scatter a little bird seed in the yard. Add a little extra to the tip at your favorite restaurant. Smile for no good reason – it’s contagious. Hold the door for more the person behind you. Offer to take someone’s cart in at the grocery store. Spend a little more time without the TV on. Turn off your phone and give someone undivided attention. Make a special red and white meal. Be yourself and cherish the unique things about those around you. In early February, we will be making Valentines that will be given to the Sheboygan County Aging & Disability Resource Center to be distributed at the county Senior Meal Sites. We hope to bring a smile to friends all over the county. Throughout February, we’ll be sending out a weekly collection of Love Notes from Child’s Play kids. Keep an eye out for these heartwarming messages. Late in February, some of our older children will be visiting Harmony House to play BINGO and visit with the residents to show them that they are loved. We always enjoy building these connections between generations. Watch for a Candy Heart Guessing Game! On the front table, we are going to have a jar full of candy hearts. Please have your child guess how many are in the jar for a chance to win a prize! Jessica from Jessica’s School of Dance will be visiting us every Tuesday in February to help us explore creative movement. With the weather keeping us inside, we want to keep our bodies healthy and strong. Jessica is going to help us move our bodies, shake out the sillies and learn some new dances! There will be a small fee to cover the cost of this interesting program. Stay tuned. As winter weather blows into our community, please note that if the Sheboygan Area School District is closed for the full day, Child’s Play Learning Center will be closed too. If there is a 2 hour delay or early release due to weather, Child’s Play will be open normal hours o9f operation. Tune in to 1330 WHBL, WTMJ4, B93.7, Lake98.1 or 104.5 the Point for closing information. We will also try to send an email out when we make a closing decision. Valentine’s Day Parfait – A pretty, Valentine’s Day treat kids can make too. One of these at every place setting makes for a very beautiful table! Catnip Tuna Treats for Cats – Also known as Kitty Yum Yums, these tuna treats are sure to please the most discriminating cats in your family. Bacon Bits For Dogs – Also known as Homemade Beggins, these treats are sure to make your dog drool for more! We recently hosted an informational presentation about our 4-year-old kindergarten program. Miss Kim provided an overview of the 4K program, gave a tour of the classroom and answered many great questions. Click here for a copy of the 4K Overview we shared at the meeting. Child’s Play’s 4K program is a great option to consider as you plan for next year. Consider keeping your child in the environment they know for one more year. No travel, healthy snacks and meals, consistent routines and the same loving caregivers they know with the added benefit of solid, developmental curriculum that will prepare them for 5K. CLICK HERE to see the hand out. Thinking About Summer? Already? So Are We! 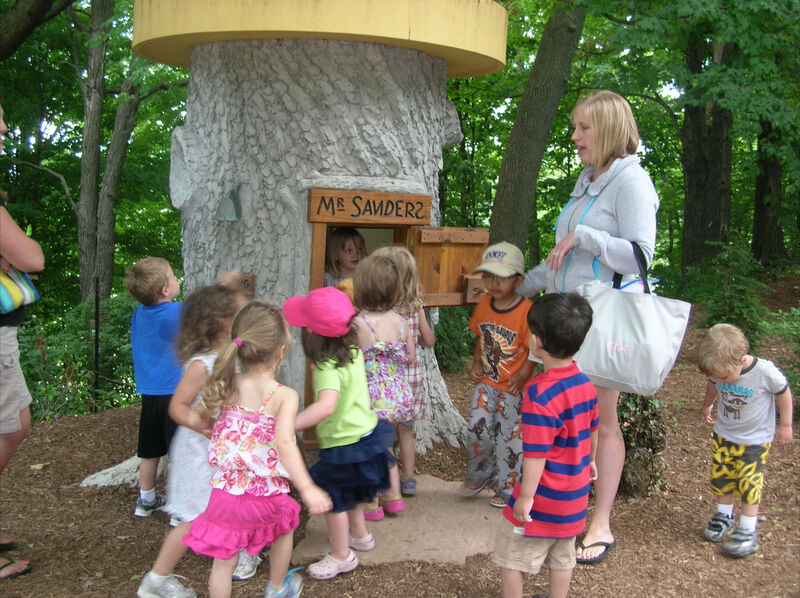 Child’s Play summer programs are available for school-age children up to 10 years of age for summer of 2013! We are working on some partnerships in our community to enhance summer programming for older children and will be announcing our plans soon. Space is limited and we will be taking summer enrollments through March 31st. Please stop in the office and put your school-age children on the list! Fill out this form to reserve your spots. Each month, we hope to share a couple of highlights in this section to offer thanks and share good news! THANK YOU – as we celebrate 25 years, we want to thank all of our families, both past and present, for thier trust. We love having you as a part of our family! CONGRATULATIONS – Ms. Laura – on the birth of baby Hadley. 2/26 Miss Kim & Miss Edith – Field Trip to the Library, 9:15-11 a.m.
2/27 The Toothfairy visits from Bullard Children’s Dentistry, 10-11 a.m., 3 years old and up. Welcome Ms. Kaitlyn! Ms. Kaitlyn is in our school-agers room and is busy entertaining this active group of children while she is completing her educaiton in Special Education through the UW Sheboygan-UW Oshkosh Collaborative Program. As an expert in drinking coffee and a love for Alternative Rock music, Ms. Kaitlyn loves to travel around the United States and learn about the German language and culture. She is most proud of her educational accomplishments and loves the family atmosphere at Child’s Play because she believes that every child deserves a caring and loving environment in which to grow. We agree Ms. Kaitlyn! Welcome to Child’s Play! Welcome to a new format! The pretty, graphic version of this post went out via email on 1/7/13. The content below was replicated without graphics purely for reference throughout the month. Please contact us if you would like a copy of the original email sent to you. It’s Winter Time! Be sure to send hats, mittens, snowpants and boots with your children every day! Feel free to leave a set at Child’s Play if you have extras. If this newsletter was shared with you, please consider subscribing. Please email cponsuperior@hotmail.com (mailto:cponsuperior@hotmail.com) if any of your contact information has changed, or if you would like to add new contact information or people for this newsletter. 2013 marks 25 years for Child’s Play and we’re going to celebrate! Read on to learn more about the history of our center and the special events we have planned throughout 2013! Snowmen At Night Celebrate at Child’s Play! Keep your eyes peeled, several snowmen will be making their way to Child’s Play Learning Center to celebrate our 25th Anniversary! Just like the book Snowmen At Night, by Caralyn Buehner, large, inflatable snowmen will appear in different places, with different poses every morning as children arrive at the center. In the book, Buehner encourages readers to imagine what snowmen do at night while the world is sleeping. Child’s Play has brought this to life. Every morning, we encourage you to talk with your children about where the snowmen might be and what they might be up to. As you arrive at the center, keep an eye out for the snowmen. They will be located somewhere in the front of the center each day. If you would like to purchase the book, it is available on Amazon, at Wal-Mart.com and other online retailers. Throughout January, our classrooms will be making celebration indoor snowmen and parents will judge the winners! Stay tuned for more information. As we move into 2013, Child’s Play will be celebrating our anniversary all year. Each month we will feature a celebration theme and coordinate activities and events. Stay tuned for more exciting details to come! As winter weather blows into our community, please note that if the Sheboygan Area School District is closed for the full day, Child’s Play Learning Center will be closed too. If there is a 2 hour delay or early release due to weather, Child’s Play will be open normal hours of operation. Tune in to 1330 WHBL, WTMJ4, B93.7, Lake98.1 or 104.5 the Point for closing information. We will also try to send an email out when we make a closing decision. ** Hot Cocoa Mix – This heartwarming recipe is perfect for post-sledding warm-up. Have the kids make the mix before heading outside. When they come in they can add the mix to hot water for a steaming treat. We have also included instructions for making this into a delicious gift. ** Cake In A Mug – Celebrate with us! This gooey cake is made in a mug and can be enjoyed just about any time. Use our Hot Cocoa Mix recipe as an ingredient for even more hands-on fun! ** 4 Year Old Kindergarten at Child’s Play! Join us for an informational presentation about our 4-year-old kindergarten program on Thursday, January 31 , 2013 at 6 p.m. Miss Kim and Miss Ann will provide an overview of the 4K program, give a tour of the classroom and answer your questions. Child’s Play’s 4K program is a great option to consider as you plan for next year. No travel, healthy snacks and meals, consistent routines and the same loving caregivers they know with the added benefit of solid, developmental curriculum that will prepare them for 5K. January HAPPY BIRTHDAY CHILD’S PLAY!!! January 11 Lake Country Academy Early Release – 11:30 a.m.
January 24 Lake Country Academy Early Release – 11:30 a.m.
Child’s Play summer programs are available for school-age children up to 10 years of age for summer of 2013! We are working on some partnerships in our community to enhance summer programming for older children and will be announcing our plans soon. Space is limited and we will be taking summer enrollments through March 31st. Please stop in the office and put your school-age children on the list! ** Staff Spotlights – New Faces – There are several new faces at Child’s Play! Please join us in welcoming Miss Jenny, Miss Jessica and Miss Edith! Ms. Jenny is currently attending LTC to finish her diploma in Early Childhood. She just started in the older toddler room and is thrilled to meet all of the families and get to know the children. Ms. Jenny loves sports, hunting, doing puzzles and word searches. She is an expert in sports and loves camoflage, dogs, Nascar (especially Jeff Gordon) and hockey. In her spare time, Ms. Jenny plays basketball and swims for Special Olympics! 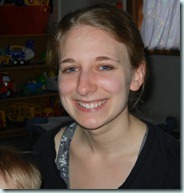 Ms. Jessica joins us with certification in infant and toddler education and five years of experience. She loves to spend time outside and baking with her son. Her favorite color is pink and she loves Christmas time. If Ms. Jessica could meet anyone, she would love to meet Elvis since she has loved his music since she was little. Ms. Edith comes to Child’s Play as she finishes a degree from Lakeshore Technical College. She has many years of experience as a youth leader, Awana leader and volunteer at her church. With one daughter and four grandchildren, Ms. Edith hopes to be a good fit for the Child’s Play family and looks forward to helping parents to know how capable they are to make huge impacts in thier child’s development. If Ms. Edith could meet one person, she would love to sit down with Maria Montessori to take in everything she had to say and pass it on. Maybe they’d even watch her favorite movie – the Lion the Witch and the Wardrobe. Ms. Edith’s words to live by come from Proverbs 3:4-6 – Trust in the Lord with all your heart and lean not on your own understanding, in all your ways acknowledge Him and He shall direct your path. Please take a moment to review the notes, announcements and ideas we have gathered for your review! Seasonal Clothes – please check cubbies to make sure your child has a change of clothing that is appropriate for the season. Running More than 30 Minutes Late for Drop-Off? Please call! 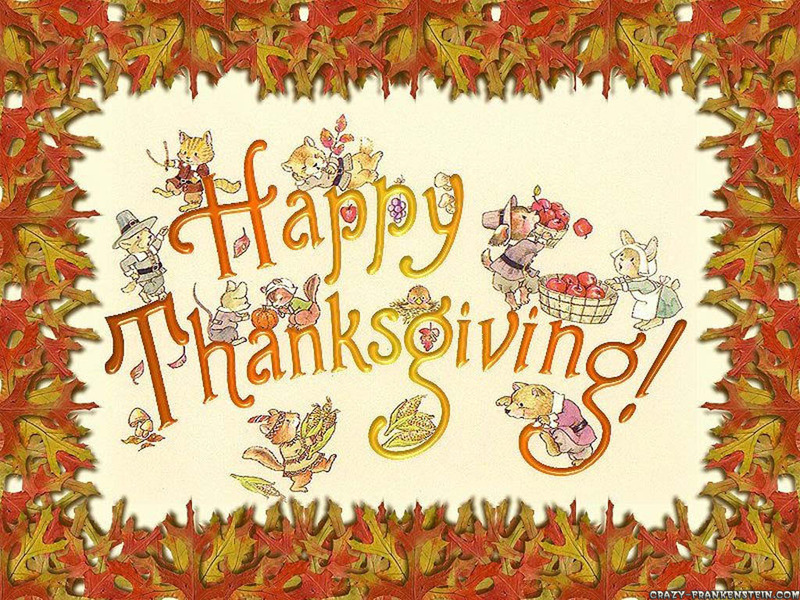 Breakfast Served until 8:15 a.m. – we serve breakfast from time of opening until 8:15 a.m.
We Are Thankful For You! In this season of Thanksgiving, we want to thank all of our families for your positive attitudes, attention and engagement with our center. Your willingness to work with us in partnership makes it a pleasure to care for your children every day! For the next several months, we will be featuring a classroom to tell you more about the exciting things happening in our center! Teacher: Ms. Dawn Ages: 5 – 10 years, children attending school off-site. Location: On the pink carpet behind the loft in the big room at the back of the center. 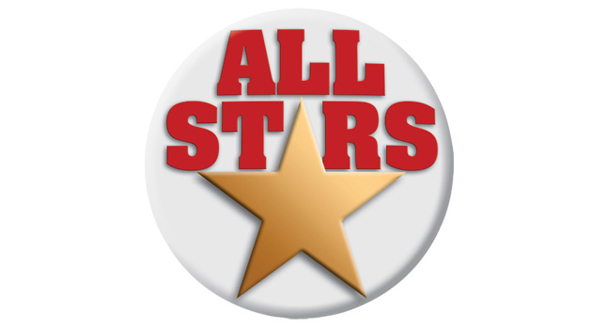 The main objective of the School-Age “All Stars” Classroom is to have a safe, fun environment for students to come to after school. Ms. Dawn strives to make sure all of her friends feel equally important and have a place to unwind after a long day of school. While the All Stars like to enjoy free play and large group games such as tag, the human knot and go fish, Ms. Dawn plans themed activities every day. Many of her activities include intricate craft projects and ways for the children to unwind through creativity and self-expression. In October, Ms. Dawn created a Halloween project making witches out of egg cartons! During free play, the children often play outside or with the magnetic toys, cars and geo tracks. On no-school days, this active class is often on the road – experiencing field trips throughout the region. These trips have gone to local parks, Terry Andrae State Park, bounce-house centers, the zoo, pumpkin farms, movies, restaurant tours and much, much more. Ms. Dawn brings a high level of education and experience to her classroom. With a bachelor’s degree in Elementary Education from UW Whitewater and student teaching experience in the Sheboygan Area School District, Ms. Dawn is well qualified to shepherd a diverse group of children. As a result, Ms. Dawn makes a huge effort to engage the children in planning and decision-making. She is keenly aware of the importance of including them in choosing themes, activities and projects. Because of this effort, Ms. Dawn has built strong relationships and trust with her students. 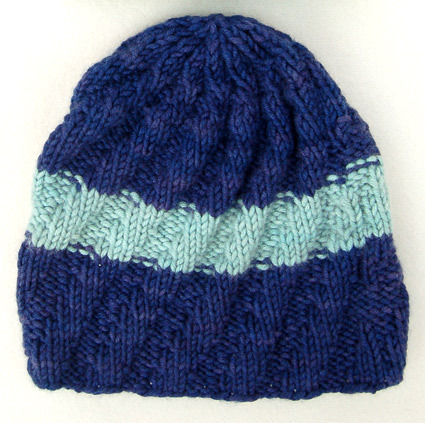 A neighbor to the center recently delivered a box of hand-knitted hats for your children. We will put out a limited quantity on the front table for you to choose from. They will be available on a first-come, first-served basis. Please help yourself! Deck Your Halls – New for 2012! Introducing the Child’s Play Wreath and Poinsettia Sale! We are working with Don Caan’s to offer wreaths, poinsettias and swags as a fundraiser for our SmartBoard project and playgrounds. Order forms will be distributed via cubbies, but are also available by clicking here. Please seek orders from your family and friends. Nothing smells better than fresh wreaths this time of year! All order forms and money are due to the office by November 15. Please make checks payable to Child’s Play. Delivery is set for Tuesday, December 4, 3:30-6 p.m. Please help us reach our fundraising goals so we can purchase our SmartBoard and update our playgrounds. Meet Our High School Co-Op Students! You may see two young women in our center this fall who are learning about Early Childhood Education through a co-op program. Miss Ashley and Miss Sidney are students at South High School and will be assisting our staff while gaining valuable, on-the-job experience. 11/9/12 Early Release – Lake Country Academy – 11:30 a.m.
11/14/12 Festival Foods Field Trip, Ms. Kim, Ms. Lisa and Ms. Inga’s class. 11/15/12 Wreath & Poinsettia Sale Orders Due! 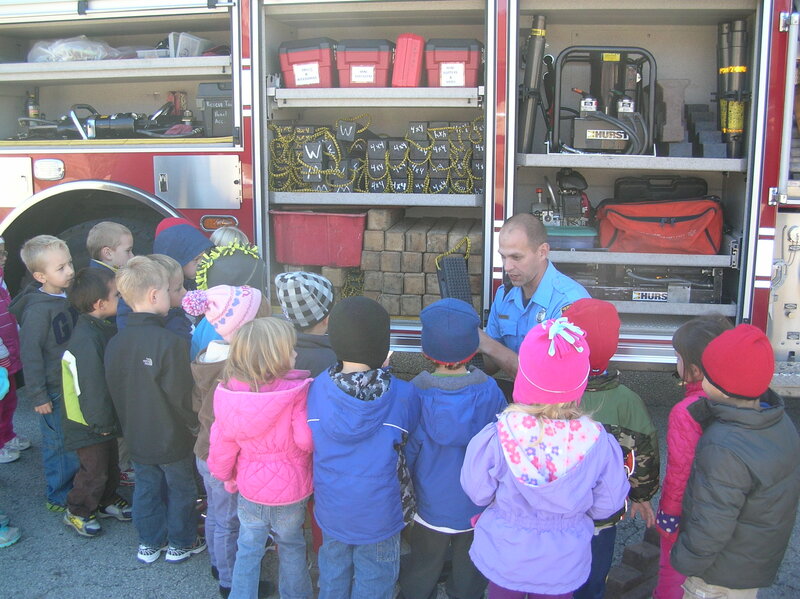 11/21/12 Early Release – Lake Country Academy – 11:30 a.m.
SHEBOYGAN – Child’s Play Learning Center was recently visited by firefighters from the City of Sheboygan’s 25th Street Fire Station who brought fire education directly to children as young as two years old! 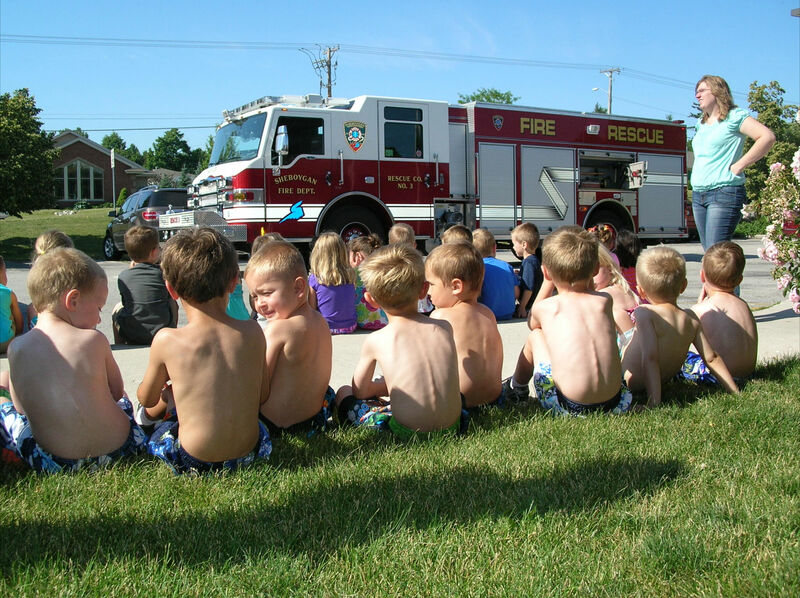 The objective of exposing children to fire safety and the firefighters themselves is to help children form good habits and develop a positive relationship with the idea of a community helper. By meeting a firefighter and seeing all of their gear in a non-intimidating environment, children will be more prepared if they are ever involved in a real fire or emergency situation. The firefighters and equipment will not be as foreign and scary. The Front Table is full of new Scholastic Book Club fliers! The Online Ordering System can be accessed at www.scholastic.com/bookclubs. Enter code GW8T9. Every order placed online earns rewards for our classrooms! The next Infant Opening is August 2013. Back to School Time – Mom & Dad: We are here for you. Many of our friends are going to school for the first time or heading back to the classroom this week. This is a very exciting time of new routines, new friends and growth. Lots and lots of growth! We know that this inevitable growth can also be tough for you and your children and we want you to know that we are here to help! If our staff can help with transitions in any way, please let us know. We have helped hundreds of kids move through these transitions and we probably have an idea or trick that will help your little one/s handle new things and changes in routine with ease. Before you know it, your family will find comfort in the new routines and you will continue to grow together. Time to Refresh the Cubbies! Change out the clothing in your child’s cubbie – make sure they have some warmer options in up-to-date sizes. They grow too fast! Consider refreshing your child’s art supplies – crayons, markers and scissors – to start the year with a fresh set. SAFETY NOTES: Please try to use the WEST driveway for drop-off and pick-up. Now that school is back in session, our school-age friends will be using the eastern driveway to get on and off of thier buses. Thanks for helping us to keep our driveway safe! 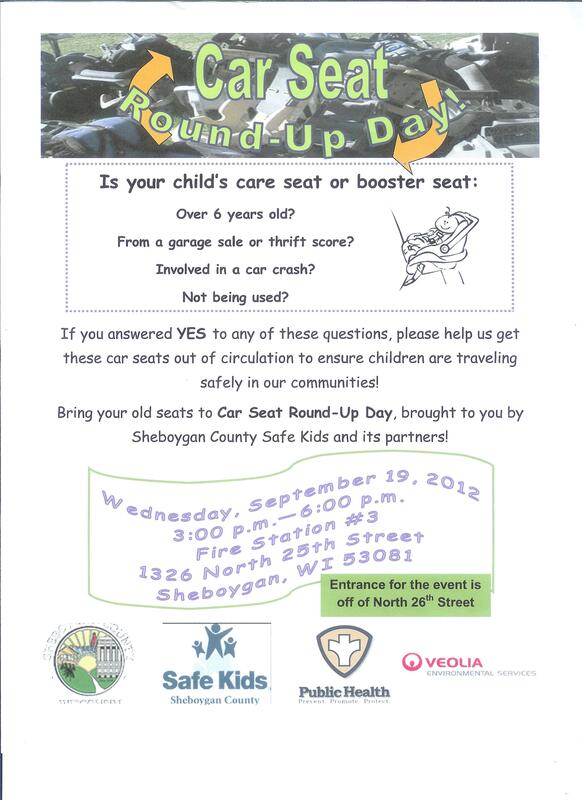 Speaking of safety…the Sheboygan County Chapter of Safe Kids will be hosting a Car Seat Check & Round-Up on Wednesday, 9/19/12 from 3-6 p.m. at Fire Station #3, 1326 North 25th Street in Sheboygan. Bring in your vehicle and car seats to make sure they are installed correctly and used in the safest way for your child/ren! Click Here for more information. If you have not already done so, please turn in your Transportation Form (aka: Alternate Arrival/Release Agreement – Child Care Centers Form). We need one of these for every child who will be traveling to and from Child’s Play on a school bus or other transportation. Click Here for a copy of this form and please turn it in immediatly. First Days, Early Release & No School Days Coming Up! Please note the following early release days and no school days that are on the Sheboygan Area School District calendar. Please let us know if your children will be with us on these days for hours that are slightly different from your regular schedule. 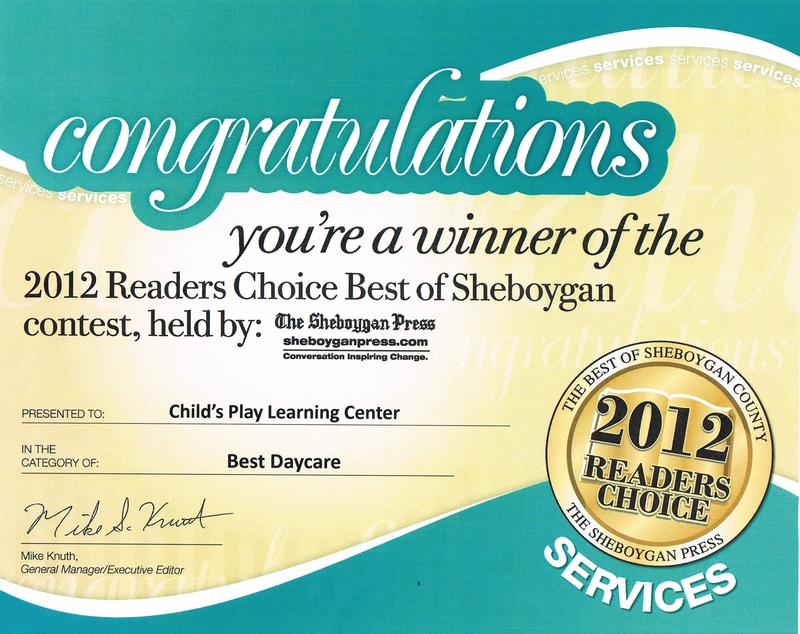 9/14/12 Early Release at 11:30 a.m.
9/27/12 Early Release at 11:30 a.m.
From Learning To Lunch – Featured in the Sheboygan Press! 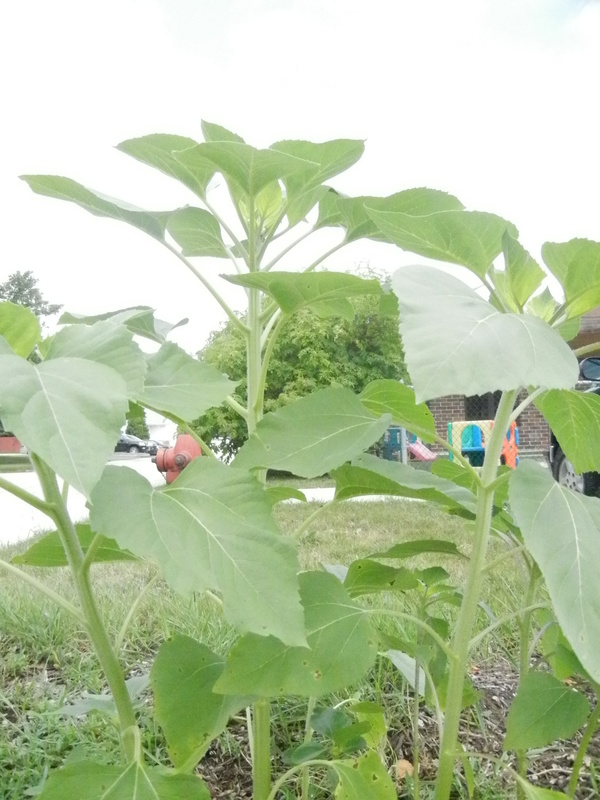 In case you missed it, the Sheboygan Press recently featured our container garden! We were thrilled to tell our community more about our great center and to focus on this special summer program that our friends really enjoyed! Need An Easier Way To Pay? Don’t Write Another Check! All tuition payments are due by 6 p.m. on Tuesdays – at the very latest. Additional fees will be assessed for all late payments. If you want to make life easier – we can automatically bill your credit card for tuition payments – you’ll never have to write another check! Stop in the office to discuss the process and make arrangements. 10 New Families Have Chosen Child’s Play Learning Center! Thank you for sharing your experiences with friends and family. Please join us in welcoming new faces and new friends to our center family! And keep in mind that…Our Referral Program Is Back! 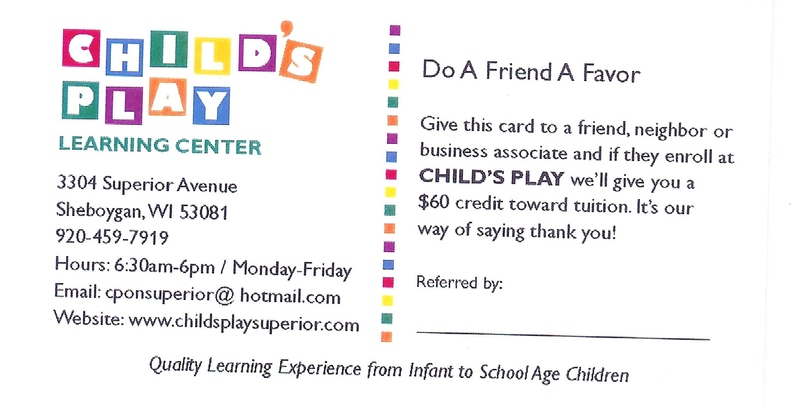 As you talk with other parents, family and friends, please note that Child’s Play will give you a $60 tuition credit for every referral to our center! Please share your experiences with others and grow our center family! Feel free to send people to our website: www.childsplayonsuperior.com for more information and share this newsletter! You will find referral cards on the sign-in table to share and help us give credit where it is due! Get Ready for Mr. Z’s! We will be kicking-off a Mr. Z’s Fundraiser on October 2! Tasty food items, great gifts and beautiful gift wrap will be available for you to purchase or sell to friends and family. All proceeds will be used to purchase raised bed planters for our garden! The sale will run through October 19 and delivery will be on November 14, just in time for pre-holiday planning! Helping Others…While Cleaning Your Closet! If you need a place to stow those old coats you will, inevitably, be replacing this year, please remember the Coats For Kids Drive is off and running! Click Here for more information. Favorite Holiday: Christmas because she loves spending time with family! Ms. Vicky teaches in the Little Wonders classroom with Miss Shirley. She has been with Child’s Play for 2 1/2 years and has been in her current role since January! Ms. Vicky’s favorite thing about Child’s Play is working with Ms. Shirley, Ms. Lynn, Ms. Penny and Ms. Judy because they are always willing to help each other out when needed and make a great team. She also loves getting hugs from the toddlers whenever she comes in for work. It always reassures her that she is doing a great job as a teacher! In fact, this is what she is most proud of – knowing that she has become a successful toddler teacher! 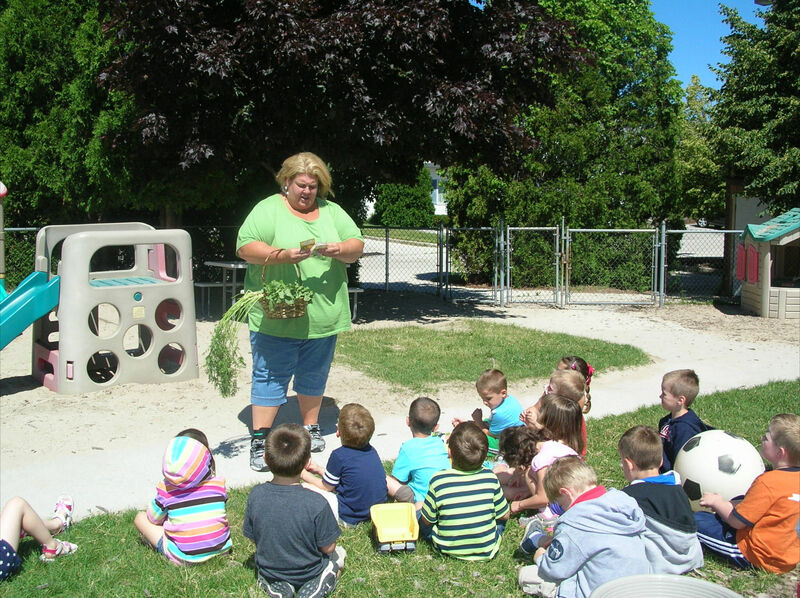 Ms. Vicky is a 2009 Graduate of the Early Childhood Education Program at Lakeshore Technical College (LTC). She is also very interested in geneaology and has mapped her entire family and her husband’s family. She found out that her second-great-grandfather on her mom’s side fought in the Civil War! She also recently met a distant cousin she found on ancestry.com and hopes to meet another distant relative she found very soon. But if she could meet anyone, alive or passed, she would like to meet her Grandmother. She just knows that she would have been really close to her, if she were alive. Ms. Vicky Loves her job as a toddler teacher. She loves being able to see all of the children learn and grow throughout the couple of months that the are in her room. She thinks it is very rewarding and wouldn’t change it for anything! When Ms. Vicky isn’t entertaining the toddlers or working on her family history, she likes spending time with friends and family and taking walks after work.